The prime minister’s promise at last week’s Conservative conference that austerity was almost over was every bit the gift for Jeremy Corbyn that some had expected. The Labour leader kicked off with the NHS – how could austerity be over, he asked, when there were 5,000 fewer mental health nurses than in 2010? The government was spending “record levels” on mental health and only today had announced plans for more support in schools and the first minister for suicide prevention, said Mrs May. More needed to be done but her government had ensured “parity of esteem for mental and physical health” in the NHS for the first time. It was a Labour amendment that ensured “parity of esteem”, said Mr Corbyn, and “urgent action” was needed now to improve services. Then he was on to the police. When will austerity be over for them? The government was pumping £460m a year extra into policing this year, said Mrs May. So why was the Police Federation taking the government to court over its latest pay settlement, asked Mr Corbyn. Then it was on to schools. Will all teachers get the independently recommended 3.5% pay rise this year, asked the Labour leader. School funding was “at a record high” – and 1.9m more children were in schools that had been rated good or outstanding since 2010, thanks to academies and free schools which Labour wanted to scrap, said the PM. Teachers were getting another real terms pay cut next year and there was a “chronic shortage” of staff, Mr Corbyn hit back, because so many newly-qualified teachers were leaving the profession and the government was failing to meet its recruitment targets. He then turned the spotlight on local government funding and the crisis-hit Conservative councils in Northamptonshire and Somerset. When will austerity be over for them? The independent inspector said Northamptonshire County Council’s problems were “not due to lack of funding”, said Mrs May. Councils have had to make “tough decisions”, she added, but more money was coming. Then it was time for a reprise of her Tory conference speech. Without a halt to the cuts in the upcoming Budget, and a “decent pay rise” for public servants, her claim that austerity was over was “a great big Conservative con”, roared Mr Corbyn. Mrs May trumpeted her record, claiming wages were up and fewer people were in “absolute poverty”. 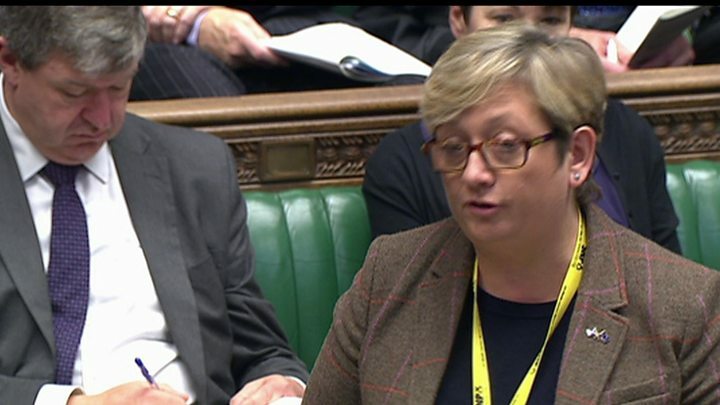 She pointed to cuts to income tax and energy bills, and the fuel duty freeze, before ending with a claim that Labour would take the country “back to square one”.The SNP’s leader at Westminster, Ian Blackford, called for work capability assessments to be scrapped.The SNP’s Joanna Cherry raised the case of a Polish constituent who has lived in Scotland since the age of six and has received a “Kafkaeque” letter after applying for benefits. 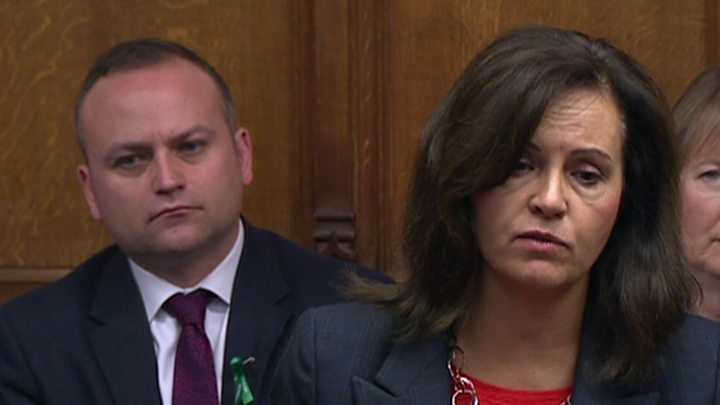 Labour’s Caroline Flint called on Theresa May to reverse the £3bn of cuts that were built in to the roll-out of Universal Credit. Ho-hum…. Just another wilting Wednesday, as MPs yomped through another super-sized PMQs (48 minutes) that was distinctly short of super content. The shining exception was the veteran Ken Clarke, who urged the PM to push through a soft Brexit, using pro-EU Labour votes to counter any threat of rebellion by hard Brexiteers on the Tory benches, or “right-wing nationalists” as he called them. 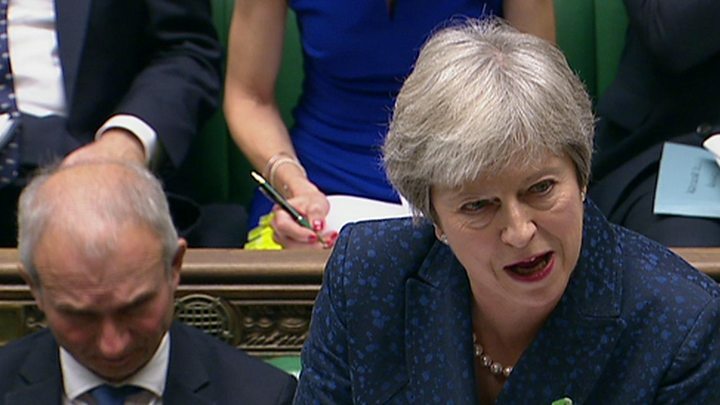 The PM’s non-answer did not endorse that strategy, which would be pretty poisonous to Tory unity, and simply hoped everyone would support the deal she struck – but she offered a crumb of comfort to the Brexiteers by saying it was the Government’s duty to Leave, in the light of the referendum decision. So while their exchange provided no answers, it did highlight some of the choices the prime minister faces – and that will eventually confront all MPs, as well. It may well be that some further uncomfortable compromises are in the pipeline, and with the government’s DUP allies warning they might ditch their deal with the Conservatives and refuse to support the Budget, at the end of the month, the position is increasingly wobbly. A second front was opened by former Cameron policy wonk Alex Burghart who asked about a trade deal with Japan and the Trans Pacific Partnership – a prospect that Brexiteers think would probably be ruled out by the PM’s current Brexit policy. Theresa May sounded positive. Was that the sound of her spiking one Brexiteer gun, and ruling in an approach they say won’t be possible? As widely predicted, after the PM hailed the end of austerity in her conference speech, Jeremy Corbyn highlighted areas of public services still squeezed, and highlighted the impact on pay for teachers and the police. Confronted by questions like this, the PM rattles off figures and lapses into official-ese, constantly repeating the phrase “in respect of”. This does not strike me as a very effective riposte – and although she eventually did get round to saying her government would not abandon fiscal responsibility, that phrasing was again a lapse into official jargon, rather than a fighting retort. The difference? Mr Corbyn’s questions could be (and doubtless were) slapped straight on to social media for the delectation of austerity-weary swing voters; the PM’s needed subtitles for those who don’t speak high formal Whitehall-ese.